Featuring the same Speed Injected technology as the M5 Driver, the M5 Tour driver utilises a compact 435cc head with optimised aerodynamics for improved workability and maximum clubhead speed. Every head is individually speed tested and injected with tuning resin to optimize COR across the entire face. The new, more flexible Hammerhead slot works in conjunction with Speed Injected Twist Face to produce a larger sweet spot and preserve ball speed on off-center strikes “M5 Tour driver features the same incredible technologies of its bigger M5 brother—like Speed Injected Twist Face and Inverse T-Track—in a smaller, Tour-inspired 435cc package. 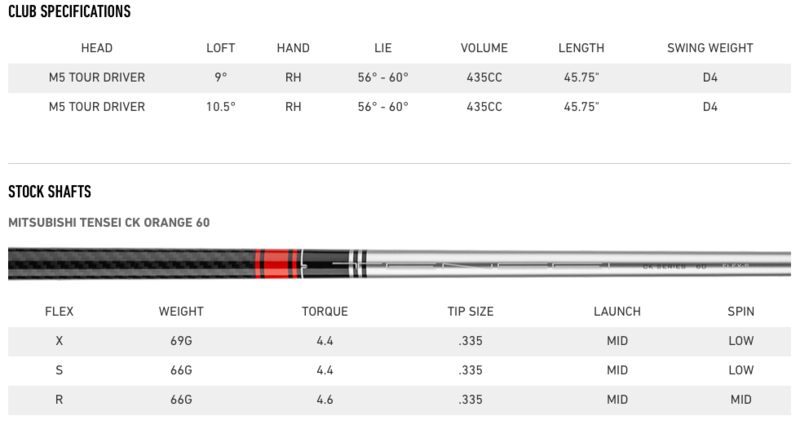 The result is improved aerodynamics for increased clubhead speed, refined players shaping for enhanced workability, and lower spin properties for more distance and control. Factor those elements in with the “spicy” nature of Speed Injected technology, and M5 Tour becomes a truly powerful and versatile tool to have off the tee."